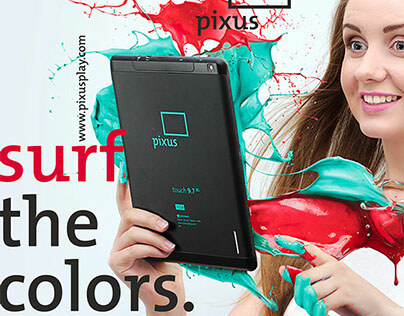 Pixus is the young Ukrainian brand of digital devices. Pixus devices help people to receive information, to learn new things, to communicate, to find inspiration and just have fun. Brand`s logo consists of fixed and variable elements. Constant element is the frame. On the one hand it symbolizes the focus, some field, a picture of the world, on the other - the limitations we face in life. Variable element contradicts to the accuracy of frame, it hints at rebellion and show the opportunity of going out of the frame, and it can be absolutely any image. Today Pixus has four product lines: Tablets, mp3-players, earphones and chargers. For each product line, its own unique blot (variable element) was created. For example, the Blob, which is used for the line of tablets, symbolizes the connection of several kinds of feelings, but for the player – stream of music. It is important that all blots were created not with the help of soulless machines and graphics editors, but with the help of designers who were using the variety of colors and materials. And each blot brings some energy and emotion. As a result of combining constant and variable elements, Pixus has got the new modern logo, which incorporated the development and dynamics, bright colors and emotions, the desire to achieve freedom and find the new knowledge. 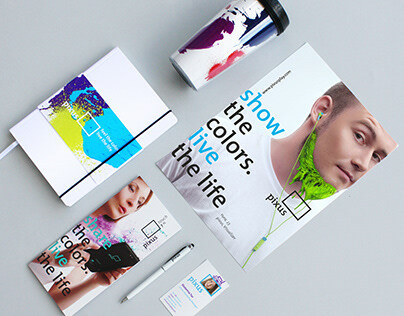 Logo, that fits Pixus slogan: feel the colors, live the life.